Please note this product has now been superseded but is still listed for archival purposes. Our newer flood lights offer a further 20% to 40% increase in light output. Suitable replacements include the LITE-BR-FL-480W and some of our other LED Flood Lights. The LITE-PS 400W General purpose LED flood light consists of 4 x BRIDGELUX® 100W BXCE 45 mil COB LEDs mounted equidistant on a heat sinked reflector panel. The positioning of the LEDs allows almost 100% light projection towards your carpark or warehouse. 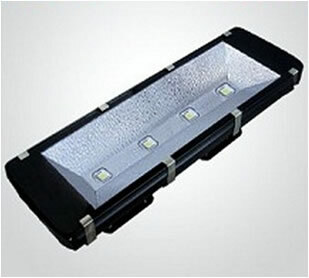 This means a single 400W LED flood light can be used to replace up to 2 x 1000W Metal Halide flood lights. This is because the 1000W Metal Halide bulb is typically mounted horizontally and projects a 360 degree beam where there is a loss of backwards and sideways light depending on the efficiency of the reflector. 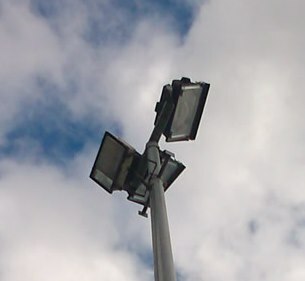 Whereas the LED projects all light fowards meaning a single 400W LED flood light can be used to replace up to 2 x 1000W Metal Halide flood lights whilst maintaining similar light levels. See our example at Castlehill Toyota where 2 x 1000W Metal Halide flood lights were replaced with a single 400W LED flood light. Compared with the original 2 x 1000W Metal Halide flood lights the beam spread and light quality of the LEDs is much better and provides an 80% electricity saving. The 400W LED flood light replacing a single 1000W metal halide offers a payback time of approximately 1 to 1.5 years saving thousands of dollars. For example, 20 Floods has a life time $ saving of > $200,000 over 13 years. LEDs alone have an L70 lumen maintenance typically greater than 40,000 hours (>70% of the original light output). In contrast the metal halide has a typical L50 lumen maintenance of only 10,000 hours, that is only 50% of the original light towards the end of its lifespan. 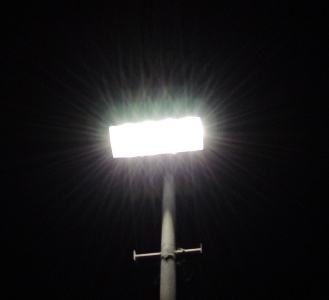 So in the case of a 2000W metal halide you are often seeing closer to the light ouput of 1000W. Therefore, the higher efficiency of the LED projection system and high lumen maintenance (little light degradation < half that of a metal halide) allows up to 70% to 80% energy saving to be achieved. In the Castle Hill example there is an 80% saving in electricity due to the more efficient use of the LED flood light. Use of Industry leading 4 x US BRIDGELUX® 100W LED light source or more economical EPISTAR® LED sources. > 50,000 HOURS. Citizen/Nichia also available. Utilizing World leading MEANWELL® LED Drivers great luminaire stability, lifespan and optimal performance is achieved. Each 400W LED Flood light uses 2 x MeanWell HLG-240H-36A 240W drivers providing a surplus of 80W meaning the driver is operated below maximum capacity which improves life span. Adequate heat radiation area and excellent thermal management systems enable the LEDs to operate at optimal temperature levels leading to longer lifetime, efficacy, and color consistency. Click the button below to add the 400W LED Flood Light - 1000W+ Metal Halide Replacement to your wish list.